Interested in a new and unique iOS experience? Enjoy yelling at your friends? If you answered yes, than ‘Spaceteam’ is what you’re looking for. It’s what I call a FPS (first person shouter) and is thoroughly entertaining. I downloaded ‘Spaceteam’ based upon recommendations from the TRS guys, Dan Trachtenberg, Jeff Cannata & Alex Albrecht, who wouldn’t stop tweeting about it. I had no idea what to expect, but quickly fell in love. To start the game, you must turn a big dial all the way around to “play”. From there, the game randomly generates an alien character for you and you wait in a lobby for the rest of your team. The game can only be played cooperatively and supports 2-4 players locally – meaning everyone has to be in the same room, with Wi-fi enabled. Once everyone is ready they are beamed up to the spaceship and are told, “don’t worry the ship flies itself”. Each player has their own random control panel with levers, switches, dials, buttons, etc. and receives instructions on what to do to keep the ship flying safe. Sound simple? The twist is that, more often than not, the instructions you receive refer to an action on one of your teammates control panels, which quickly leads to lots of yelling of weird techno-babble. Watch the video below to get a better idea. This is one solid experience. Henry, the man behind ‘Spaceteam’, quit his day job with BioWare and started Sleeping Beast Games to make small independent video games and has put a lot of effort into it. 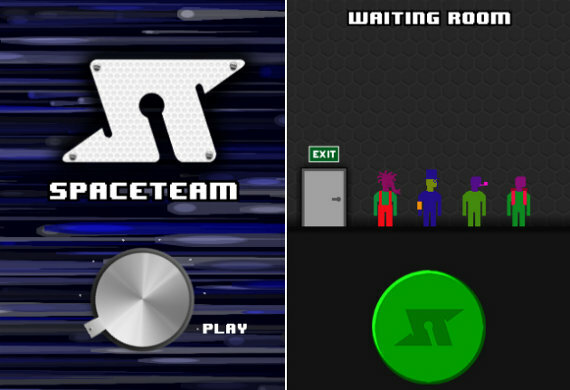 I love the music, art style, feel, and panic that ‘Spaceteam’ induces. So far, I’ve only played the game with one other person & can only imagine the chaos of a 3 or 4 person team. I highly recommend ‘Spaceteam’ for anyone with friends that own iOS devices (just about everyone these days). If this game doesn’t get you worked up, you have no soul.